Do you want your business to STAND-OUT and be the business that everyone talks about and wants to visit? Does your business want more customers? Do you want your customers to return to you more often? And, do you want tor customers to spend more on each visit? I really hope you answered yes to all three questions. I’m going to ask you to think about the first thing that comes to mind when you read the questions below. What’s the most incredible restaurant you know? What hotel offers the best service? Who makes the best quality or coolest shoes? The one thing all these businesses have in common is they provoke a “positive reaction” in your mind. Is your business seem to be hitting the wall and cannot seem to grow! Do you wish your business provoked the same “positive reaction”? Allow me to regress just a few years ago. I had the pleasure to spend a few days with Brigadier General Chuck Yeager, you know the man that broke the sound barrier and the movie the “Right Stuff” was about. 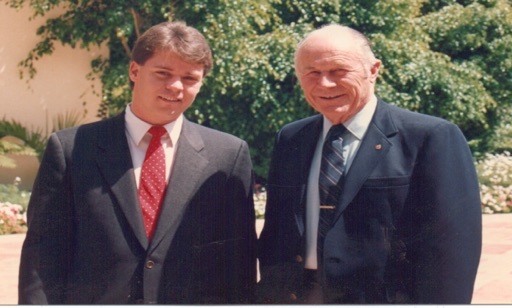 Yes, that’s me in 1985 with “Chuck” at the Ritz Carlton in Southern California. During our time together he shared with me many stories and one thing stood out to me was the 1% rule. The 1% could mean success, failure or death in some cases as he explained. You see most people fail and give up because of doing things just 1% wrong. He explained they tried numerous times to break the sound barrier and the aircraft buffeted so bad, but he thought what if we add a trim to the horizontal stabilizer it might relieve that severe buffeting and it worked and rest was history. Just by adding a small adjustable piece of metal to the horizontal stabilizer, that was the 1% difference. 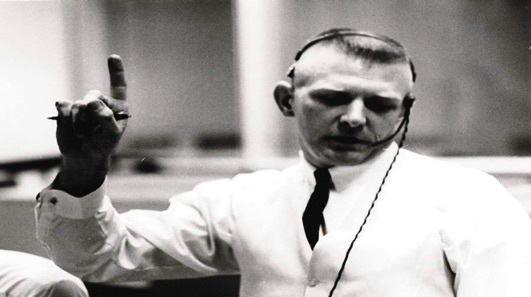 I met another icon in the space race, Gene Kranz mission control director for the Apollo Moon landings. Mr. Kranz shared with me a story of again where the 1% rule applied. Gene told me that NASA did not have the luxury of being even 1% off. NASA had to be 100% spot on all the time. Mr. Kranz continued to say if we were just 1% off on our calculations to the moon the astronauts would have missed the moon by over 1 million miles. Let’s apply this 1% rule to business and see how it would work. You see if you make just a 1% change now the results can be dramatic in months or years out. So, how do we know what 1% change to fix or modify your business? That’s the million dollar question, but very easy to figure out! You see most business owners are okay with operating their business the same mundane ways others do. Most businesses let the managers or GM’s put plans in place for a 10-20% growth and it all looks great on paper but most fall short. There are no tactical plans or controls put in place or even a plan to create incredible reactions for their customers. Actually, nothing could be further from reality! Do you think Walt Disney wanted to build a mundane amusement park? Did the Ritz Carlton want to be just another hotel? Did Ralph Lauren just want to be another clothing manufacturer? If you want to make your business stand-out from the crowd then maybe it’s time to “Market Different™” and re-brand yourself. Let me introduce myself I am Bobby Richardson and I started my career at Apple Computer as a marketing evangelist… a Marketing Executive with any other company. Things like titles helped define Apple and when you think of an Evangelist you think of a preacher and that is exactly what I was but I preached Apple marketing. Since 1979, I have had the chance to work with some of the most iconic companies, like Disney, Coca-Cola, Nordstrom, The Cheesecake Factory, The Ritz Carlton just to name a few. You see I studied these companies over my last 30 years and learned key and unique practices that they use to differentiate themselves in the marketplace. It’s paying attention to the details right down to how you point (with your hand), dress, words you use and much more. I will help you discover how to apply these incredible tips, techniques, and methods to make your business stand-out in your market. You see it’s really more than marketing yourself differently or re-branding yourself it is really about taking the business and re-inventing the culture from the ground up. Most business owner always think about the cost of any change but clearly, the cost of not doing something will cost you so much more. Will Rogers, once said, “Even if you are on the right track, you stay there long enough you bound to get run over”. Meaning if things worked in the past they may not down the road, your competitors are gunning for you, so what are planning to do about it? I had 100’s of business owners tell me. I’ve tried everything and nothing seems to work for my business and we are different and those marketing things won’t work for us.. nothing could be further from the truth. If that’s what you’re thinking, you need to adjust your MINDSET and learn what you don’t know. Let’s teach you how to “Grow” and "Market Different™” to become the “GO TO BUSINESS” of your space. The benefit of Marketing Different can grow revenue 2-3 times or more. It’s time for a conversation. Let us “teach” you how to Dominate your Market™. This can be done in any industry or market. 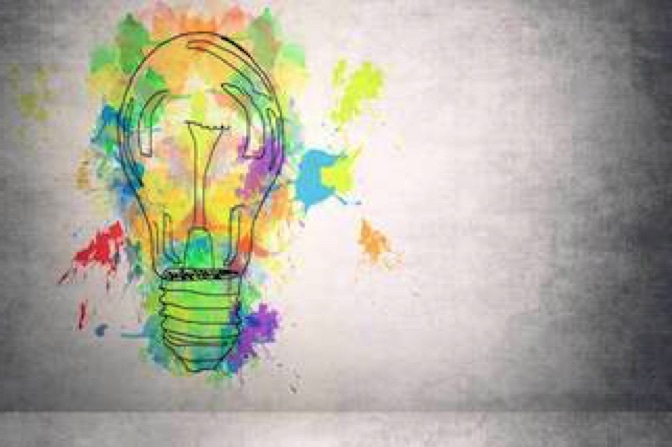 Getting your business to STAND-OUT! Changing how you will think about Marketing FOREVER!